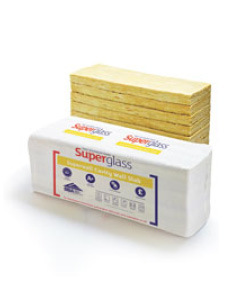 Superglass Superwall 36 is a British Board of Agrément (BBA) approved, non-combustible and water repellent glass mineral wool insulation cavity wall batt. The flexible batt is supplied at 455mm wide to allow easy installation between standard vertical wall tie spacings and minimum on-site cutting and waste. Superglass Superwall 36 is designed to provide thermal insulation in full-fill or partial-fill external masonry cavity walls, up to 25m in height for full-fill and with no height restriction in partial-fill (additional requirements apply for buildings above 12 metres in height for full fill and above 25 metres in height for partial fill). Superwall 36 is BBA approved for use in all UK exposure zones (subject to conditions detailed in the BBA Certificate and NHBC Standards). – Provides excellent thermal performance with a thermal conductivity of 0.036W/mK.